Chicago—ALA Publishing eLearning Solutions announces a new iteration of our popular eCourse, Using WebDewey and Understanding Dewey Decimal Classification. Violet Fox will serve as the instructor for a 4-week facilitated eCourse starting on Monday, May 6, 2019. 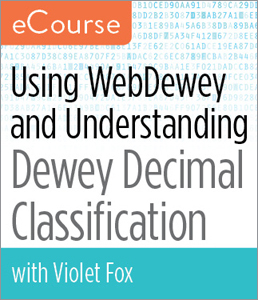 With the expert cataloging instruction of Violet Fox, you will gain a comprehensive grounding in Dewey Decimal Classification® principles and practice. Starting with the basics, this eCourse will teach you how to assign DDC® numbers with correct meaning in hierarchy, build numbers using tables, and apply numbers that help patrons browse your library. Experienced users will benefit from guidance in building complex numbers, in using Table 3 for literature, and ideas for more effective use of the DDC® system. Violet Fox is one of the editors of the Dewey Decimal Classification. She received her MLIS from the University of Washington in 2013. Her research interests include the intricacies of zine cataloging and the ethical implications of classification. Registration for this ALA Publishing eLearning Solutions facilitated eCourse, which begins on May 6, can be purchased at the ALA Store. Participants in this course will need regular access to a computer with an internet connection for online message board participation, viewing online video, listening to streaming audio (MP3 files), and downloading and viewing PDF and PowerPoint files. The 23rd Edition of the Dewey Decimal Classification and Relative Index is ©2011-2014 OCLC Online Computer Library Center, Inc. ("OCLC"). All copyright rights in all previous editions of the Dewey Decimal Classification are owned by OCLC. WebDewey screen shots are ©2014 OCLC. Mr. Dewey and His Dot are ©1992 OCLC. Dewey, DDC, Dewey Decimal Classification, OCLC, and WebDewey are registered trademarks/service marks of OCLC. Used with permission.